In Defense of Communism: MLToday- What Should Bernie Sanders Supporters Do Now? 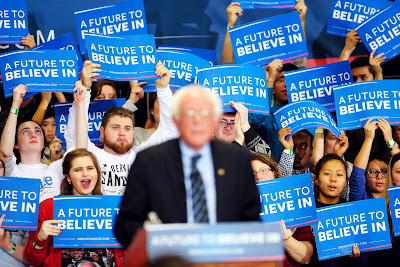 MLToday- What Should Bernie Sanders Supporters Do Now? An interesting analysis by Marxism-Leninism Today. The 2016 elections reflect the deepening crisis of the capitalist economic system in general and the US political party system in particular. The Democratic primary contests are over. Sanders has endorsed Clinton. Supporters of Bernie Sanders are being prodded to accept meekly the corporate Democrat Hillary Clinton as the Lesser Evil. Some suggest that this foreshadows, by some alchemy, a “resounding progressive mandate,” someday. This is magical thinking. Already, at the Democratic Party Platform drafting meeting in Orlando, Florida, the Sanders’ positions on issues such as the Trans-Pacific Partnership, Palestinian rights, and single-payer healthcare have been rebuffed by the Clintonites. Yet, there is an opportunity in this moment. Worsening social discontent sparked insurgencies in both major parties. With the narrowing differences between the two monopoly parties, the received wisdom, “Vote for the Lesser Evil” makes less and less sense to ordinary voters, let alone to Sanders supporters. In the 2016 primary season, something new happened. The voter response to Trump and to Sanders represented a new level of mass disaffection from this system and from politics as usual. Everyone knew voter anger had to come, sooner or later. Forty years of stagnant or declining wages, the export of jobs and de-industrialization, growing inequality, police violence against Black youth, mass incarceration, attacks on unions and labor rights, rolling back the social safety net, endless wars, the 2008 Great Recession and the halting recovery, gridlock in Congress, growing poverty and insecurity --- all have altered the consciousness of tens of millions. Voter anger has finally found political expression at the ballot box. The way anger has been expressed is not symmetric. In the case of the Democrats, Bernie Sanders -- against the anointed corporate Democrat opponent -- offered a version of Scandinavian social democracy. Political independence was no part of his plan. From the start he pledged to support the eventual Democratic nominee. To his credit he moved leftward on a number of important issues. His campaign inspired sections of the Democratic base especially youth. Sanders wound up with 12 million votes in the primaries, compared to 16 million for Clinton. Progressive/liberal insurgencies in the Democratic Party are not new: Ted Kennedy against Jimmy Carter in 1980; Jesse Jackson in 1984 and 1988; Howard Dean in 2004; Dennis Kucinich in 2004 and 2008. In all cases the insurgency petered out. Most Democrats ended up voting for the Democratic nominee, seemingly a “Lesser Evil” than a thoroughly reactionary Republican candidate. The Democratic Party establishment knows how to corral stray sheep. Conferences are being organized where Sanders activists can let off steam, but the conference agenda, on inspection, merely airs a wish list of progressive public policies. The agenda does not include concrete ideas on how to organize for political independence of the two corporate parties. That would be a conference worth organizing. At one large conference in Chicago, Green Party presidential candidate Jill Stein was refused permission to address the gathering. The Clinton camp and its surrogates seek to stampede Sanders's supporters back into the fold, for example, with talk of Trump's “fascism” or his “McCarthyism,” or the unspeakable horror of “losing” the US Supreme Court. The Lesser Evil argument has never been weaker than it is now. This new fact is all-important. 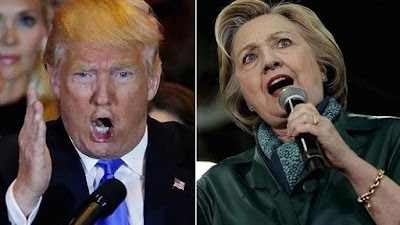 If, at the presidential level, the two big parties are equally evil, then it is incumbent on progressives to begin systematic political work for independence of the two-party system. Trump and Clinton are equally evil, but in different ways. On domestic issues (except trade), Trump is obviously worse than Clinton, but on foreign policy Clinton is demonstrably more dangerous than Trump. Trump represents a long US tradition of right-wing populism that mingles racism, xenophobia, nationalism, and isolationism with nostalgia for a golden past. Right-wing populism combines attacks on socially oppressed groups with distorted forms of anti-elitism based on scapegoating. Recent examples are George Wallace in the 1960s and 1970s, and Patrick Buchanan in the 1990s. In the 1930s, the movement led by anti-Semitic radio priest Father Coughlin was an example of right-wing populism. Political parties have a class character. Parties are the expression of social classes. They are one of the most important instruments by which classes fight for their interests and for political power. In the US today, the ruling class has two parties, the Republicans and the Democrats. To be sure, their mass base differs, but what is decisive is their funders and their controlling personnel who share the outlook and serve the needs of the same ruling class, but by means of different tactics. The class nature of the two parties of monopoly capital, always denied by them, becomes clear in a crisis and on fundamental political questions. In a “normal “ situation one party may follow a policy of maneuver and concessions to the people. The Democratic Party for most of the twentieth century vied for the allegiance of workers and minorities, conceding small reforms to maintain that coalition. The other party, the Republicans, usually rules with strongly reactionary methods and works toward strongly reactionary goals. Deep down, the two parties are, in the end, owned by the rich and powerful, by giant corporations and banks. They are committed to preserving existing economic and social relations. Since the late 1970s there has been a twofold evolution in the US party system. The two dominant US parties have both moved rightward and have both moved closer together --- at least on the fundamental issues. Admittedly, differences remain on ‘social’ issues. The monopoly stranglehold has become even more blatant now after the 2010 “Citizens United” decision by the US Supreme Court. The ruling removed constraints on billionaires’ secretive funding of elections. In 2016, so far, Democrat Hillary Clinton is the overwhelming favorite of Wall Street funders. The rightward drift of both major parties of US monopoly capital first came into view with sharpening capitalist crisis and the collapse of Keynesianism in the mid-1970s. More rightward movement came with the rise of Reaganism and Thatcherism in the early 1980s. The differences between the two parties of Big Business have narrowed, beginning with President Jimmy Carter in the late 1970s. The Democratic Party abandoned any pretense of being the party trying to complete the unfinished New Deal agenda, which it tried to do, to some extent in the Kennedy-Johnson years. In 1981 Reagan took over most of Carter’s economic program. In the 1990s self-styled “New Democrat” Bill Clinton and his Democratic Leadership Council were at the heart of the remaking of the Democratic Party. Over time, the Democratic Party became the “GOP lite” party that it now is. World historical factors were the backdrop to these trends in the US party system. The downfall of so many socialist states in 1989-91, and the end of an alternative social system competing for the loyalties of working people, took away much of the appeal of a two-party system to US ruling circles. Since the end of the New Deal they had been satisfied with a stable formula for their rule: a conservative center-right party, the Republicans, alternating in government with a mildly reformist center-left party, the Democrats. A US working class voter, at least up until recently, may have reasoned, plausibly, that social pain might be somewhat less sharp with a Democrat in the White House rather than a Republican. Such a voter might cast a "Lesser Evil" vote. Marxism, however, maintains a longer-range strategic class viewpoint as its North Star. First, Marxism does not regard electoral politics as the whole of politics. Second, Marxism’s unique contribution is to inject a class viewpoint into all politics. In electoral politics, this means an end to US working class dependence on the two monopoly parties. Socialism means rule by the working class and a revolutionary remaking of society. A working class always settling for the Lesser Evil cannot win socialism. For Marxists, to accept “common sense” reasoning about which candidate or party is somewhat less evil is completely indefensible. Lesser evilism drives people back into the two-party fold. Lesser evilism always results in the working class lining up behind one or another party of the ruling class. As long as they are bound to Big Business' political chariot, working people cannot win any fundamental victories. Political independence, based on the action of the labor movement in the first place, is a prerequisite. The monopolies have long understood labor's potential as the core of an anti-monopoly electoral coalition. Big Business uses every possible method to keep labor from building its own political and electoral organizations. Is Trump such a danger that Clinton must be supported? Trump is bad, but he is not a fascist. Marxism has a time-tested, scientific definition of fascism: “Fascism is the open, terrorist dictatorship of the most reactionary, most chauvinist, most imperialist elements of finance capital.” The decisive test is not Trump’s statements (often contradictory) nor the thuggish actions of some of his followers. Rather, the key test is the class forces behind Trump. As of this writing (early July 2016) his populism and unpredictability have scared off much of Wall Street and other big donors, as well as the Republican Party political establishment. Some have been frightened even into supporting Clinton. She is getting generous help from Wall Street. Another test is the historical circumstances. Unlike in Germany in the early 1930s, where revolution was a possibility, US capitalism is not in any existential crisis. State power is not slipping out of the hands of the representatives of Wall Street. True, the Republican Party is in a bit of a shambles. It remains to be seen whether the revolt of the mass base of the Republican Party in the 2016 primaries will have lasting effects. Is the composition of the US Supreme Court reason enough to support Hillary Clinton? Only if one believes US lives are more important than the lives of the innocents abroad who will continue to die under a Hillary Clinton foreign policy. Clinton has a proven record as a war criminal and interventionist, as the peoples of Libya, Syria, Iraq, Honduras and elsewhere know well. She has been more than willing to sacrifice the interests of workers and minorities in our country to the interests of Wall Street and the transnational corporations. Accordingly, there is no Lesser Evil in these two presidential choices. What is the Way Forward for Sanders’s Supporters? Supporting Hillary Clinton is not the way forward. Corporate control of Hillary Clinton's actions will trump any minor changes that Sanders' supporters were able to place in the Democratic Party Platform. Bernie Sanders's supporters can further progressive change by increasing pressure from the Left, by strengthening existing forms of political independence outside the two major parties. By “independence,” it goes without saying, class independence is meant -- independence of Big Business financing and control. US history teaches that major new political parties are born when a crisis causes a mass breakaway from old party allegiances and when advanced forces have patiently prepared the way. The best example: the Abolitionists and their allies, after unwisely abstaining from electoral politics, experimented with party after party – the Liberty Party, the Free Soil Party, eventually the Republican Party. By the late 1850s the crisis over slavery reached a breaking point. Old political parties, such as the Whigs, the Democrats, and the “Know Nothings,” disintegrated or split over the slavery question. But the anti-slavery coalition was ready: it had a candidate, Lincoln, a central demand -- no extension of slavery into the territories -- and a party, the Republicans. The struggle against corporate power in the 21st century is akin to the struggle against the power of the slave owners in the 19th century. The supreme task now is to build a mass people’s party that will curb corporate power. It cannot be done without an organized revolutionary vanguard. The Abolitionists were such a vanguard in their era. A Marxist-Leninist party will be in this era. Time will tell whether a mass breakaway from old party allegiances is under way. Regardless, Sanders supporters can and should organize for independence now. It will be a difficult long-term task. Many questions have no easy answers: how to move the working class and the other core class and social forces for radical change, some still mired in Lesser Evilism, to higher ground. The question of the lower reaches of the Democratic Party, where, arguably, corporate power is not decisive, needs to be evaluated more fully and concretely. How Hillary Clinton Ignores Peace, July 2, 2016, by Robert Parry.